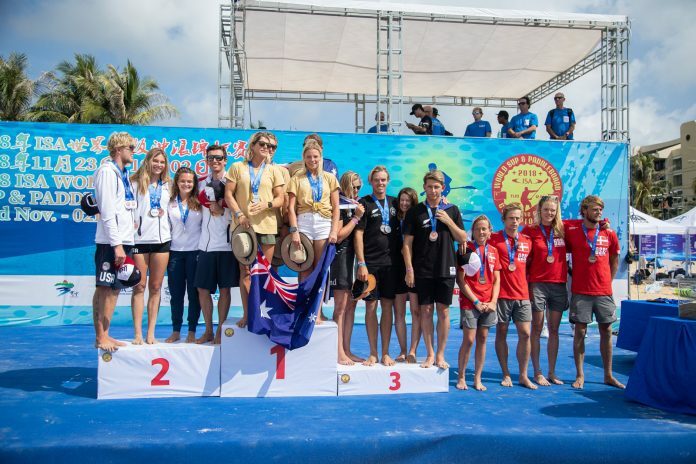 The New Zealand Team has finished fifth place overall after a bronze medal in the relay race, the final event of the 2018 International Surfing Association (ISA) World Stand Up Paddle and Paddleboard Championship completed at Wanning, China overnight. The New Zealand Team could not bridge the small points difference to catch Spain and make the podium despite bringing home six medals from the event. Australia won the overall team rankings for the sixth straight year. The Kiwi relay team was led by triple medallist Trevor Tunnington (Aus based) along with Tara Hope (Auck) on the stand up paddleboards and Danny Hart (Mnt) and Devon Halliday (Mnt) on the prone boards. The team edged Denmark by less than half a second. Australia won gold ahead of USA who claimed bronze. Prior to the relay races, Tunnington added a second medal to his tally with silver in the Men’s SUP Sprint Race. The performance left him exhausted for the distance races being held the next day and he had to pull out mid-race. Danny Hart (Mnt) was the top performing Kiwi in the distance races finishing fifth in the Prone Discipline. Ollie Houghton finished tenth in the SUP Distance Race while Tara Hope finished eleventh. Devon Halligan finished eighth in the Women’s Prone Distance Race. Earlier in the event the Kiwi’s secured three medals in the shorter technical races with Tunnington taking a bronze in the men’s 5km Technical Race, Danny Hart bronze in the Men’s Prone Technical Race and Ollie Houghton silver in the Under 18 Boys Technical Race. The event started with the Stand Up Paddleboard Surfing where Stella Smith (Gis) surfed her way to New Zealand’s first medal in the discipline – a bronze in the Women’s Division. The New Zealand Team secured their best ever result of third in 2017 and podiumed in fourth place in 2016. Please see below for the full team that competed at the 2018 ISA World Stand Up Paddle and Paddleboard Championship held at Wanning, China from the 24th November – 2nd December.